Dress your bathroom in its very best, and create a sumptuous space for yourself or your guests. When you experience the feeling of the softest cotton against your skin, you'll never look back. Envelop yourself — and your home — with the sensation only this rich cotton offers. These are very nice and soft. 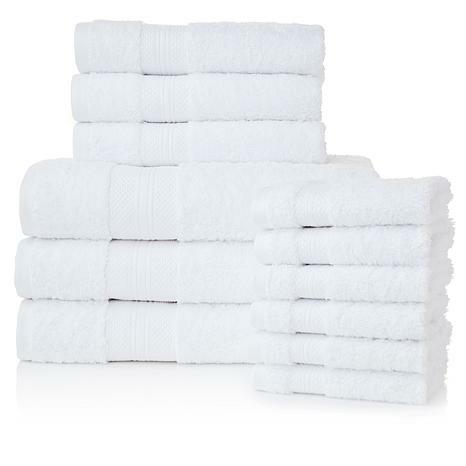 My very nice pricey towels went to college. so these were a great backup for guests and visits. 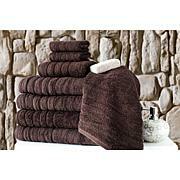 nice big towels,wish more then 3 bath towels, came in the set, do not really need hand towels. Towels are spectacular. Oversize but not too big. 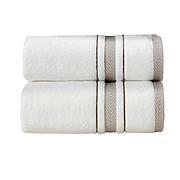 These towels just soak up water so quickly, no more drippy trails from the shower. Wash clothes have enough thickness to hold soap and leave you feeling really clean. I got the white to stage my home for sale. Have been using them and love them. I did not need the washcloths, would have rather had more towels. This gave off a lot of threads in the dryer first time out, but came out great and have not shed on me while using. They are heavier than I expected, no idea how anyone could call them thin. They're more than enough to dry anyone off - I don't like the heavy thick towels that take forever to dry. 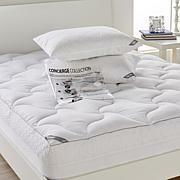 Luxurious quality at an excellent price point! These towels continue to impress me with each use!